A. Dienes is also with the Department of Electrical Engineering and Computer Sciences, University of California, Davis, California 95616. Degenerate four-wave mixing in a separated absorption-gain system, such as that of an organic dye, is studied by using a four-level model. 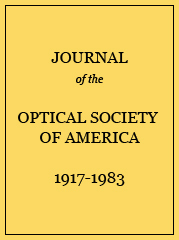 The effects of the nonlinearity arising from the displaced emission spectrum are found and compared with the results of the two-level model of Abrams and Lind [ Opt. Lett. 2, 94 ( 1978); Opt. Lett. 3, 205 ( 1978)]. A nonsymmetric saturation behavior over the width of the absorption line is shown to exist that can be detrimental to the phase-conjugate reflectivity. Otherwise, minor differences are seen from the two-level case.